I love lemon drizzle cake and this recipe is adapted by one from How to Be a Domestic Goddess, Nigella's wonderful book. I always adapt recipes to reduce the amount of sugar. Most recipes have far too much IMO and that results in super sweetness. I love sweet things but don't want to feel icky after eating cake. I also substitute some or all of the flour with spelt flour. 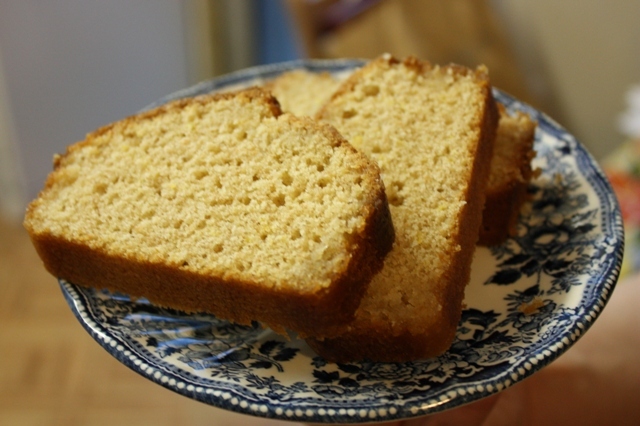 I like spelt's denseness but didn't want this cake to be too dense either. Anyway, it turned out gorgeous: properly lemony, nice and sweet, and sticky on top. In fact, it is calling to me from the tin: Eat more of me! Sounds very yummy, Nuala. I have the same problem with cakes calling 'eat me!' from the tin. It's the reason i have to take baking holidays! Nuala, this sounds delicious. will definitely try it. lemon drizzle is my favourite! Need something kids will leave us a piece of. Side note - do you have Hansa'a Indian Vegetarian Cookbook? Very easy recipes from her Gujarati Restaurant - wish her puds weren't so sickly though...I often think of you when cooking from it. I don't have the Hansa book. I have a ton of ceggie cook books and love them. I will look out for that one. Ta for stopping by. There's a good prune 'n' choc cake on here that you could try. Sounds awful, tastes great !